The source is Andrew Oswald at the University of Warwick. In his paper “Commuting in Great Britain in the 1990s,” he writes: “Our estimates imply from Table 7 an approximately 44% longer journey-to-work time for male owner-occupiers relative to those renting from the private sector housing market.” The data is British but I would guess it translates to the U.S. Interesting in light of the link between foreclosure rates and commuting times, as explored in this documentary, this article about Contra Costa County, among other pieces. Comments Off on If You Rented, You’d Be Home by Now. Click here to leave a comment. “There are countries in which the communal provision of housing, transport, education and health care is so inferior that inhabitants will naturally seek to escape involvement with the masses by barricading themselves behind solid walls. The desire for high status is never stronger than in situations where ‘ordinary’ life fails to answer a median need for dignity or comfort. Then there are communities—far fewer in number and typically imbued with a strong (often Protestant) Christian heritage—whose public realms exude respect in their principles and architecture, and whose citizens are therefore under less compulsion to retreat into a private domain. Indeed, we may find that some of our ambitions for personal glory fade when the public spaces and facilities to which we enjoy access are themselves glorious to behold; in such a context, ordinary citizenship may come to seem an adequate goal. 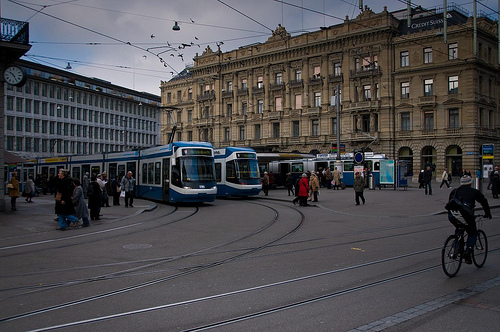 In Switzerland’s largest city, for instance, the need to own a car in order to avoid sharing a bus or train with strangers loses some of the urgency it has in Los Angeles or London, thanks to Zurich’s superlative train network, which is clean, safe, warm and edifying in its punctuality and technical prowess. There is little reason to travel in an automotive cocoon when, for a fare of only a few francs, an efficient, stately tramway will provide transport from point A to point B at a level of comfort an emperor might have envied. Comments Off on The Emperor’s Tram. Click here to leave a comment.